Aubrey was abandoned with his brother Franklin by his previous owners who went 'on holiday' and never came back. 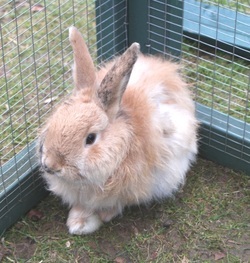 He is an angora rabbit and so he will need lots of regular grooming. When he came to us his fur was matted and in a bad way – hence the bad hair-do! He also had a nasty ear infection. We have brought him back to full health and his fur will grow back to the beautiful soft fawn and brown colour you can see in the photo. We are unsure of his age, but we believe he is fairly young. He will be neutered. He will be a beautiful bunny who will require lots of time spent brushing out his fur - probably at least 10 minutes a day. So he is looking for a new home with someone who can dedicate this time to him.